You will often see reference to the tap test or coin test method for finding damage in composite materials. It is used in aerospace, so it must be good, right? As a qualified quality assurance technician having held CASA, FAA and a host of aerospace quality certifications, I am able to clarify this information. How does the tap test work? The method involves gently tapping the part with a special tap hammer or even a coin, hence the coin tap reference, you don't want to tap too hard though as this may create damage. The impact energy travels through the part causing it to resonate or ring in the same way a tuning fork rings at a certain frequency or note. If there is an inconsistent condition such as an unbond or major delamination, the audible ring will be different. By listening to the tonal changes, an indication that there may be damage can be noted. The method is dependant on the skill and experience of the operator. It is cheap and simple and works reasonably well for these type of defects. In aerospace Non Destructive Inspection it is a backup (known as a secondary) method or used in non critical applications, the primary method is ultrasound, so parts that are critical get an ultrasound scan. Typically the method is used for finding flaws in bonded parts such as unbonds on flat panels between the composite or metal skin and the honeycomb core. Because it is an acoustic method, it is very dependant on the geometry of the part in the same way a different length tuning fork provides a different note. Thus the operator needs to be aware of how the sound wave or vibration travels through the part. Large consistent flat areas with thin skins are the most suitable, as the skin thickness increases and the curvature increases the results are less reliable. It is typically ok for finding unbonds in the composite skin to the honeycomb core greater than about 10mm in diameter. It is simple for an experienced technician to give a part a quick "tap" at any obvious visual damage indications, any suspected damage found is then scanned with the primary ultrasound method to validate. Tap testing is typically not recommended for laminate testing as it is unreliable in finding common laminate defects. For bonded parts if the damage is below a critical size or the material thickness is above a limit or located within geometry constraints it will not be able to find the damage. Porosity and voids, resin dry and resin rich areas also cannot be identified unless they are so bad it is obvious visually anyway. Light impact damage known as BVID, (barely visible impact damage) will also not be detectable. Background noise etc can also interfere with any results. How is this related to assessing damage in bikes? Bike frames are typically made from thin laminate with localised thicker areas at the higher stress joins. Bonded parts are limited in modern frames and typically no honeycomb core is used in the way some aircraft panels are constructed, with the exception of some disc wheels. On frames with bonded parts at the tube junctions such as imternal or external lugs, the compound curvature geometry and laminate thickness at the lug areas as well as the tube shapes contribute to getting unreliable information from a tap test. The damage also needs to be above a critical size dependant on the geometry of the inspected area, hence a 5mm defect in a seat stay that is only 10mm wide would probably not be found but will have a large effect on the structural integrity. Other factors such as internal joins, fillers and inserts will also affect the ability to get meaningful results. So as you can see, the tap test method on its own is not able to reliably detect damage in these type of parts. Typically damage to bike frames that is able to be found with the tap test can mostly be identified visually as the primary method and then may be confirmed with a tap test as a secondary method. If an indication "taps" it is likely to be damage, if it does not "tap" there still may be damage however due to the limitations explaned above. Overall it is useful for confirming certain types of damage as a secondary method as long as you understand the limitations of the method. Rest assured we won't be giving up on our ultrasound scans any time soon, as it is a proven reliable primary method. For further information - Google "tap testing of composites". You may have seen at the recent UCI Road Cycling World Championships how a rider in the junior race crashed due to a broken fork steerer tube. Not much information has been released of the cause, however it has been suggested that the bike may have been damaged due to coming off the team car during the TT. See the article at: http://velonews.competitor.com/2015/09/news/broken-steerer-at-worlds-likely-due-to-prior-crash_386664. We see lots of forks with damage to the steerer when performing our carbon bike assessments, almost 2 out of 3 forks we scan has a fault or some form of damage. 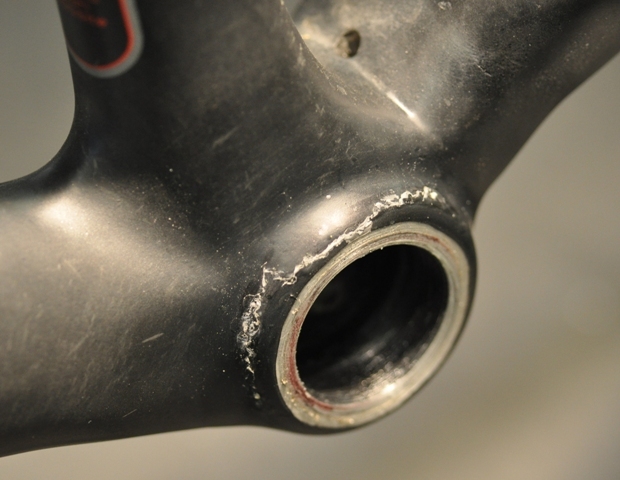 Sometimes the damage is visible such as a crack due to overtightening of the stem or the incorrect fit of the compression plug. In other cases the damage only shows up in the Ultrasound scan, such as a delamination from an overload or porosity/voids during manufacture. Incorrect cutting of the steerer when fitting the fork can also cause a delamination which may then grow over time. In some cases the manufacturer has become aware of the production fault and recalled the fork, we have a link to the recall pages here. Either way, this damage can cause a sudden failure, posibly resulting in serious injury. 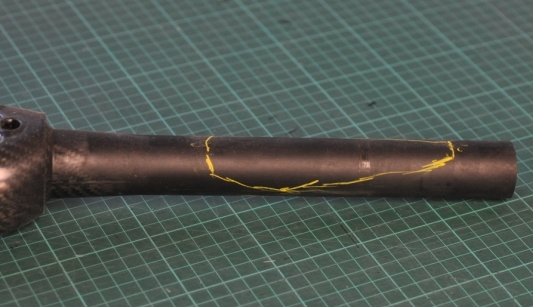 The photo shows a fork that showed no visual signs of damage, however the area marked in yellow was delaminated, severely limiting its structural capacity. We recommend regular inspection of this critical area, and the use of torque wrenches during assembly. If your bike has been involved in a crash or impact, such as on the car roof rack, we can assess the bike for any signs of damage with our Ultrasound scan. In most cases fork steerer damage can be repaired making the fork fully functional and safe again. We recently had a frame come in for a scan that had been repainted, the person buying the frame was told that it was repainted only and that there were no repairs on the frame. However when we scanned the frame we found a repair on the frame where the handlebar had impacted the side of the top tube. Fortunately the buyer was wise enough to get a scan done. The repair had porosity throughout and the quality of the resin used is unknown, so it may have failed during use. The paint wasn't that good either, with the stripes off centre and blotches in the colour! Two stripes on one side and three on the other! Remember it is not the paint that takes the structural loads, the carbon laminate must be sound. Repairs to carbon may pass the visual eye test, but are no match for the Ultrasound scan. If you are unsure of the history of a bike get it checked with a scan prior to buying it. Recently we have had a number of bikes come in with problems with the bottom bracket shell insert. The problems have been with the aluminium insert, either disbonding from the carbon with a crack around the insert, or voids in the adhesive joint, again leading to a crack at the insert. The failures typically occur due to a combination of a flaw and a less than ideal design, or user error in assembly or dis-assembly. The bikes were all big name brands. A couple of these came to us after being "repaired" by another repairer, in both cases the repair didn't last the first ride before the crack reappeared. The "repair" was not successful for many reasons including them not having the ability to find the problem in the first place. Putting glue on the surface and painting over a crack does not actually make a structural repair. The other thing which showed the lack of specific knowledge about bikes was that the threaded bottom bracket shell had not been faced after painting. Threaded BB shells must be faced to ensure proper operation of the bearings, so the previous "repair" cost the rider money and watts!! Another bike was scrapped because it was not safely repairable. In this case it had a aluminium BB30 shell. It had previously been fitted with a BB30 to BSA threaded adapter which is pressed and bonded in place. The owner then had a bike shop remove the adapter after which the damage appeared. I suspect that the adapter was not removed properly, probably by hitting it with a hammer, which caused the fracture of the bonded joint. Bonding aluminium to carbon is not an easy thing to do properly, special treatments and materials are required to even have a chance of the parts holding. Other issues such as galvanic reactions and thermal mis-match also contribute to problems along with poor design. See our other tech article on metal bonding for more information. Don't hit a sub 1kg carbon frame, (or any frame really) with a hammer. If using a threaded BB shell ensure that the shell is faced and the threads are clean. If seeking a repair ensure that the repairer can actually find the damage. Painting the bike does not make a structural repair.